Grace is a medium‐sized girl with red hair and blue eyes. She's always dressed with a black crop top and purple shorts which allow her to show off many tattoos. Her ears are decorated with a pair of black earrings and piercings, and her nails are varnished in the same color. A slightly dark eye shadow contrasts with the intensity of her light eyes. The red hair is partly shaved on the sides. Grace definitely pays attention to her appearance. The way the two sisters talk to each other, usually using derogatory terms, proves on the contrary how close they are. Grace is maternal when it comes to her little sister, making sure she does the right things at school. 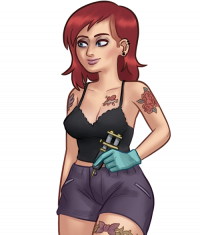 Grace is friendly and willing to help the main character or her friends, but she always asks for something in return. Grace is Eve's older sister. They live together in an apartment above the tattoo parlour called Sugar Tats, where Grace works.